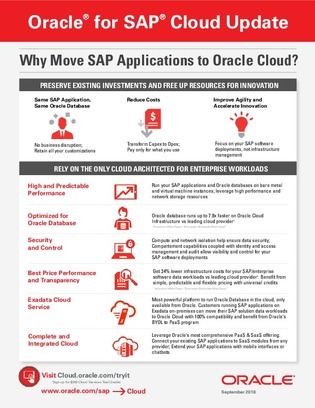 Why run your SAP applications on Oracle Cloud? In this 16-page white paper, explore how Oracle Cloud stacks up against other cloud providers, including Microsoft Azure and Amazon Web Services, and get access to SAP NetWeaver Application Service ABAP/Java for Oracle Cloud Infrastructure installation guide. To decide if Oracle Cloud is right for your SAP application migration, access this white paper, and explore why over 24,000 companies run their business in the Oracle Cloud.